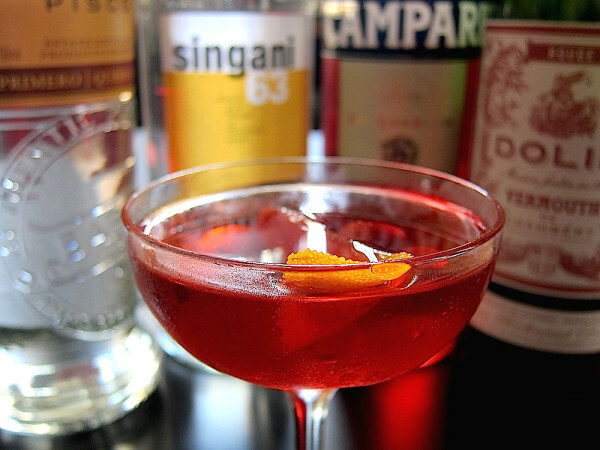 What makes a Negroni a Negroni? Is it the ingredients that are used to make the drink? Or is the history behind its origin? No matter what your perspective, there is no question that the Negroni is a classic cocktail. Now, how can you infuse the Negroni with the spirit of the Andes? This cocktail answers that question. Presenting, the Andean Negroni, or Negroni Andino — a drink that is both smoky and bitter, part Old World and part New World, and which combines Campari and Sweet Vermouth with infused Pisco and Singani to give it the unique taste of the Andes. To give the Pisco an Andean flavor, I infused it with papa seca, or dehydrated potatoes that are used in the traditional stew Carapulcra. A short 24-hour infusion was enough to impart the Pisco with a dark color and smoky flavor of the Andean potatoes. But I also wanted to use Singani, a brandy from Bolivia. With a history similar to that of Pisco, Singani is also made from grapes but which are grown at elevations between 5,000 ft. and 9,000 ft., giving it a terroir that is distinctly Andean. Together, the Pisco and Singani are what make this the Negroni from the Andes. This cocktail is dedicated to my friends at Purl and the White Lyan, two of my favorite bars in London. On my last visit to Purl, I learned to truly appreciate the history of the Negroni from Remi, and was immediately inspired to make a Peruvian version. At the White Lyan, I had the pleasure of chatting with Mr. Lyan about our shared culinary approach to making cocktails and after two drinks somehow ended up talking about how the papa seca is such a uniquely Peruvian ingredient. So, while making this cocktail I thought of my friends in London, and could almost imagine the Negroni Andino being bottled and served, no ice, no garnish, just the spirit of the Andes released from the bottle, flowing into a glass. Combine all ingredients in a mixing glass with ice and stir to chill. Served strained in a coupe and garnish with an expressed orange peel. To make the Pisco infused with papa seca, toast 1/4 cup of papa seca in a skillet and combine with 1 cup Quebranta Pisco and 1/2 teaspoon turbinado sugar in a mason jar. Seal the jar, shake, and store for 24 hours. Strain before using the infused Pisco.